White House press secretary Sarah Sanders defended President Donald Trump's criticism of Rep. Ilhan Omar Sunday , saying he "should be calling out" the freshman congresswoman for her "absolutely abhorrent" comments. Sanders also said even though Omar's comments were "unbefitting for a member of Congress," Trump wasn't wishing her any harm with his criticism. "Certainly the president is wishing no ill will, and certainly not violence towards anyone," Sanders said in an interview on "This Week." "But the president is absolutely and should be calling out the congresswoman for her not only one time but history of anti-Semitic comments. 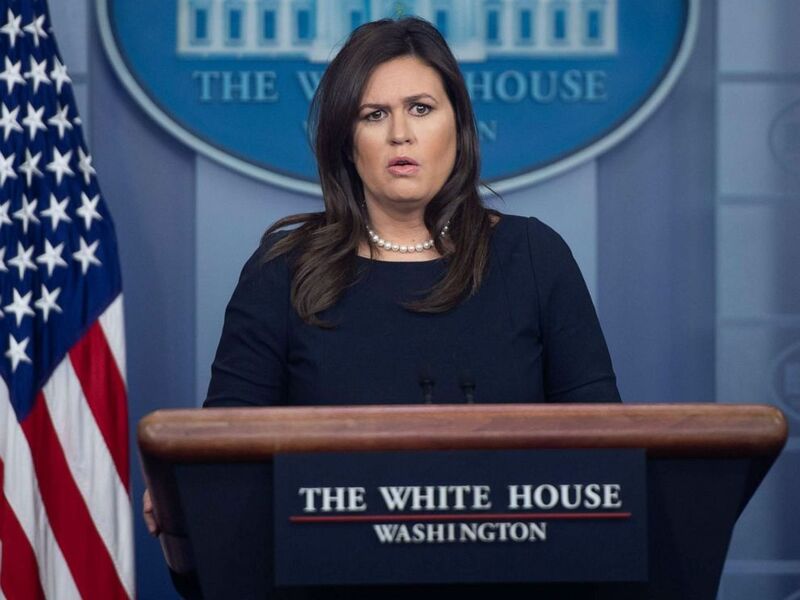 "It's absolutely abhorrent, the comments she continues to make and has made and (Democrats) look the other way," Sanders told ABC News Chief Anchor George Stephanopoulos. "I find ... her comments to be absolutely disgraceful and unbefitting of a member of Congress and I think that it's a good thing that the president is calling her out for those comments. And the big question is, why aren't Democrats doing it as well?" "For far too long we have lived with the discomfort of being a second-class citizen," the Minnesota Democrat said at the event. "Frankly, I’m tired of it. And every single Muslim in this country should be tired of it. CAIR was founded after 9/11 because they recognized that some people did something and that all of us were starting to lose access to our civil liberties." The specific words of "some people did something" have been the focus of the criticism, with most of it coming from conservative media and Republican officials who say her words trivialized the attack. Ilhan Omar, D-MN, attends a press conference in the House Visitors Center at the Capitol in Washington, D.C., Nov. 30, 2018. The tweet reads, "WE WILL NEVER FORGET!" and is pinned to the top of his Twitter feed. On Saturday, Omar vowed her "unwavering love" for America. "I did not run for Congress to be silent. No one person – no matter how corrupt, inept, or vicious – can threaten my unwavering love for America," she wrote, without naming Trump directly. "Thank you for standing with me – against an administration that ran on banning Muslims from this country – to fight for the America we all deserve." On Sunday, House Speaker Nancy Pelosi said in a tweet that the video "must be taken down." 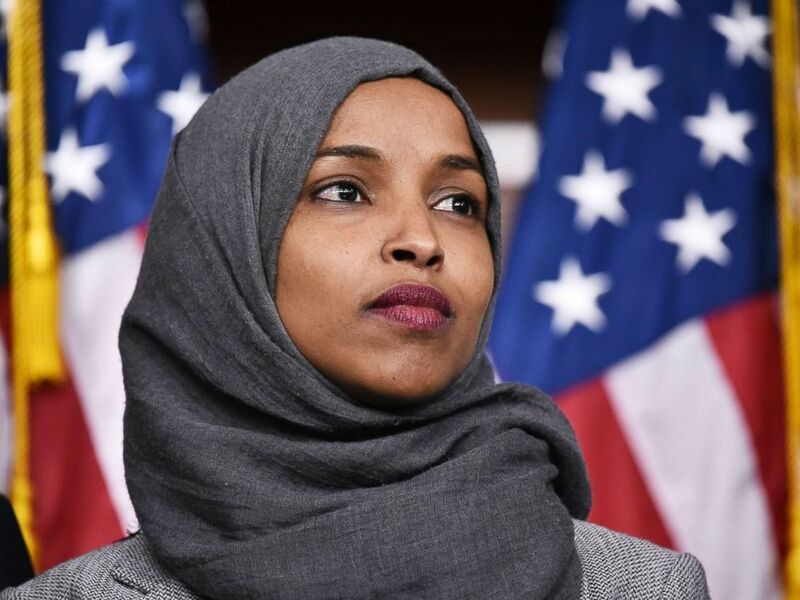 "I have spoken with the Sergeant-at-Arms to ensure that Capitol Police are conducting a security assessment to safeguard Rep. @Ilhan Omar, her family & her staff," the tweet said. "They will continue to monitor & address the threats she faces." Sen. Amy Klobuchar, D-Minn., who is running for president, said in a tweet that the video Trump posted “will only incite more hate.” South Bend, Indiana, Mayor Pete Buttigieg, who served in Afghanistan and is also a presidential hopeful, tweeted that Trump was using "that dark day to incite his base against a member of Congress, as if for sport." While Assistant House Speaker Ben Ray Lujan criticized Omar’s comments, saying they were "extremely hurtful to everyone that was personally impacted by those terrorist attacks," he called Trump’s "attacks" on Omar "disgusting and bigoted" and accused him of inciting violence against her. Rep. Bennie Thompson, D-Miss., also addressed the issue on "This Week" Sunday. He said he "saw nothing wrong" with Omar’s speech. "But she did characterize ... the most deadly attack ever on ... American soil -- a cold-blooded mass murder -- as ‘some people did something,'" Stephanopoulos pressed back. He then asked: "That does seem to downplay the importance or what happened on 9/11, doesn’t it?" "Oh, no question about it," Thompson responded. "But, again, if I look at what the president says on a daily basis, we could criticize him almost by the hour. So for him to take the congresswoman on is just another one of his, what I think, real simplistic attacks."